Actor classes are implemented by extending the AbstractActor class and setting the “initial behavior” in the constructor by calling the receive method in the AbstractActor. The argument to the receive method is a PartialFunction<Object,BoxedUnit> that defines which messages your Actor can handle, along with the implementation of how the messages should be processed. Don’t let the type signature scare you. To allow you to easily build up a partial function there is a builder named ReceiveBuilder that you can use. 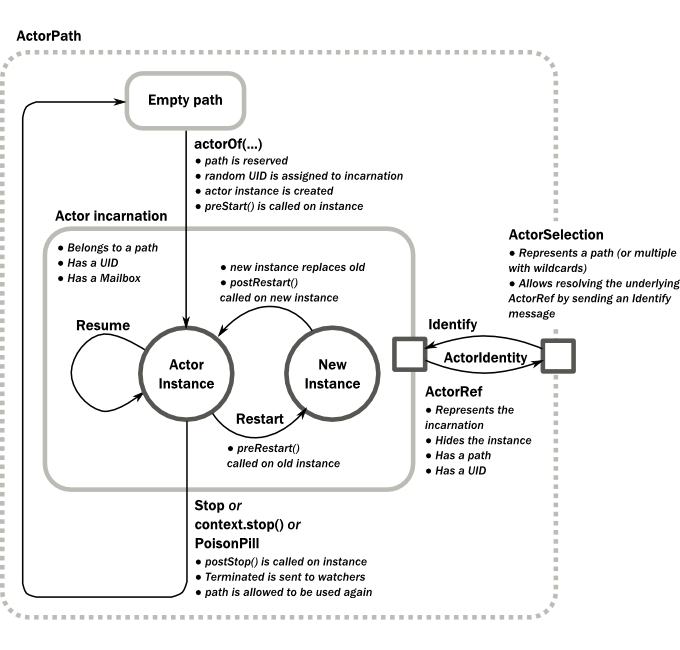 The result of argument to the receive method is a partial function object, which is stored within the actor as its “initial behavior”, see Become/Unbecome for further information on changing the behavior of an actor after its construction. The Actor trait defines only one abstract method, the above mentioned receive, which implements the behavior of the actor. The AbstractActor class defines a method called receive, that is used to set the “initial behavior” of the actor.
? ask sends a message asynchronously and returns a Future representing a possible reply. Also known as ask. This example demonstrates ask together with the pipeTo pattern on futures, because this is likely to be a common combination. Please note that all of the above is completely non-blocking and asynchronous: ask produces a Future, three two of which are composed into a new future using the for-comprehension and then pipeTo installs an onComplete-handler on the future to affect Futures.sequence and map methods and then pipe installs an onComplete-handler on the future to effect the submission of the aggregated Result to another actor. Using ask will send a message to the receiving Actor as with tell, and the receiving actor must reply with sender() ! reply getSender().tell(reply, getSelf()) in order to complete the returned Future with a value. The ask operation involves creating an internal actor for handling this reply, which needs to have a timeout after which it is destroyed in order not to leak resources; see more below. A variant of the ask pattern that returns a CompletionStage instead of a Scala Future is available in the akka.pattern.PatternsCS object. To complete the future with an exception you need to send an akka.actor.Status.Failure message to the sender. This is not done automatically when an actor throws an exception while processing a message. Please note that Scala’s Try sub types scala.util.Failure and scala.util.Success are not treated specially, and would complete the ask Future with the given value - only the akka.actor.Status messages are treated specially by the ask pattern. If the actor does not complete the future, it will expire after the timeout period, completing it with an AskTimeoutException. The timeout is taken from one of the following locations in order of precedence: specified as parameter to the ask method; this will complete the Future with an AskTimeoutException. The Receive can be implemented in other ways than using the ReceiveBuilder since it in the end is just a wrapper around a Scala PartialFunction. In Java, you can implement PartialFunction by extending AbstractPartialFunction. For example, one could implement an adapter to Vavr Pattern Matching DSL. # dependencies between the phases. # Stop accepting new incoming requests in for example HTTP. More phases can be be added in the application’s configuration if needed by overriding a phase with an additional depends-on. Especially the phases before-service-unbind, before-cluster-shutdown and before-actor-system-terminate are intended for application specific phases or tasks. For example, imagine you have a set of actors which are either Producers or Consumers, yet sometimes it makes sense to have an actor share both behaviors. This can be easily achieved without having to duplicate code by extracting the behaviors to traits and implementing the actor’s receive as combination of these partial functions.